But not so much, according to a DOE spokesperson. This is just speculation on my part, but the process of applying for a DOE loan and loan guarantee involves many layers of back and forth, including drafts of term sheets and negotiations, and companies that do receive loans and loan guarantees first receive an official conditional commitment and then later the official loan or loan guarantee. But Aptera did not make it past that first hurdle, which is the conditional commitment, the DOE says definitively. 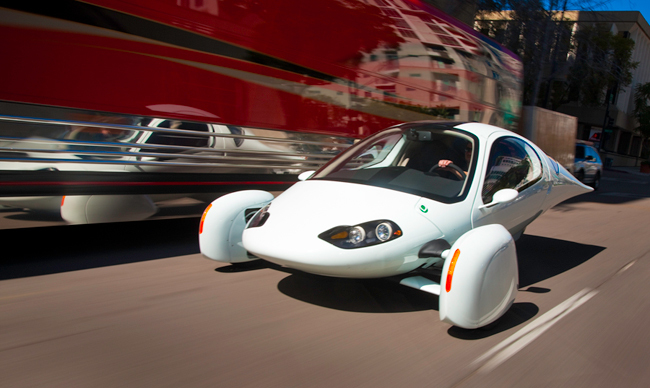 However, it should be noted that California Republican congressman Darrell Issa previously requested an expedited DOE loan for Aptera (via Bloomberg) and California Republican congressman Brian Bilbray pushed to change the law so that Aptera would be eligible to receive a DOE loan (it was previously excluded because the car had three-wheels not the standard four). Both Issa and Bilbray have been staunch critics of the DOE’s loan guarantee for now-bankrupt Solyndra. Think Progress previously reported that the Beall Family Trust is an investor in Aptera and Don Beall is a Republican donor in California. The DOE insiders were never going to let Aptera get the money. The records show that Detroit & Tesla VC controlled DOe staff put Aptera on “permanent delay” until they died. Eco-detective @katiefehren exposes Aptera CEO for lying about receiving $150M loan guarantee from US gov. @Brandon, They put out a public farewell letter from which I quoted and I also updated the post with a quote from Aptera’s co-founder. How is this not including information from the company? @Brandon, I do know they received a draft of a letter. I’ve looked at the cover letter. That is not a conditional commitment that only relied on matching funds from private investors to go through. The draft letter is a step before that and it seems clear that there were other things that were holding up a DOE loan other than that the company wasn’t able to raise private money. It seems that you haven’t spoken to the company because you continue to suggest that Aptera is implying that they had a final loan when they did not. In speaking to them they are more celebrating the fact that after getting dumped on there nose in there first attempt they were able to get within reach of the loan. I personally was rather impessed that in speaking to their representatives they were quite open about the hurdles that remain in front of them. Maybe you should actually speak with Aptera. Katie please note that Aptera’s statement said that they received a “Conditional Commitment Letter.” which they did. I visited Aptera yesterday as they were closing and they showed me the very complex 60+ page document. They explained to me that a commitment could not possibly be final without the matching capital that they were unable to raise.